After decades of being off-limits to all but a few research expeditions, beginning in the Summer of 1996, divers are now able to dive the incredible wrecks of Bikini Atoll with Marshalls Dive Adventures! CEN PAC is the original representative for Bikini diving in the US. We have more satisfied clients and provide more personalized service than anyone! BIKINI ATOLL is the final resting place of some of the most significant warships in history. The U.S. aircraft carrier Saratoga (the only divable carrier in the world) and the HIJMS Nagato, flagship of the Japanese Navy, are the highlights of this site. Along with other ships such as the battleship Arkansas and the submarine Pilotfish, nearby reefs that have not been impacted by civilization for 40 years and are teeming with all types of fish and corals, round out this incredibly unique experience. The "land only" price is $2,750. For your convenience, CEN PAC can provide all air transportation at competitive rates. We also arrange add-ons to other islands in the Marshalls or Micronesian destinations such as Truk (Chuuk), Palau, Yap, Pohnpei, or Kosrae. We strongly encourage you to visit some of the these other destinations since you will be "in the neighborhood." Airfare from HNL to BIK is $1,170. Rates to HNL vary. From the U.S. West Coast to Honolulu is about $350, and from the East Coast the fare is about $625. For those of you outside the U.S., please call for a firm quote. We are currently taking reservations for excursions from April 15 through November 15. Since we made our original announcement, our weeks are filling up fast. In order to assure you don't miss out on this opportunity, you should immediately call, fax, or fill out our on-line Information Request Form and indicate which week you would like to go and the number of travelers in your party. Majuro to Bikini on *Air Marshall Islands departs Wednesday at 8:00 a.m.--arrives 11:00 a.m. Cost is $520 pp R/T (includes divers baggage fee). Following Wednesday--Bikini to Majuro 12 noon--arrive Majuro 3:30 pm. Majuro to Honolulu--departs Wednesday 7:30 am--arrives Wednesday 2:00 a.m.
*Note: Majuro to Bikini is on a Dornaire 19 passenger plane with a 75lb weight limitation per person. Get maximum value out of your airfare by connecting to Truk or Palau. "NEW" double rooms with private baths have been constructed for divers. They have 24 hr 110v electricity, and constant fresh water. Most units have air conditioning, and the rest have ceiling fans. The main building houses the the kitchen and laundry areas and offers an entertainment center that consists of a 50" T.V. with VCR and a 1000+ video library, along with a pool table and pingpong. Water temperature is 82-84 degrees F. Air temperature is high 80s to low 90s F. Visibility is 80' to 150'. Weather is as follows: March to November is the calmest; March to April is the wet season; June to August are the hottest months. Mild trade winds and tropical showers are the norm daily. Depths: Generally the bottom of the lagoon at the primary wreck site is 180' to the sand. 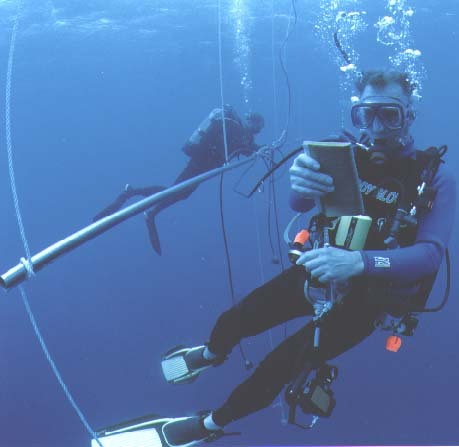 Average dive depths will be 90' to 130'. Shallower dives in afternoon if profiles allow. Steel, L.P. 85 and 104 cu. ft. tanks are standard. We also have double 85s and 104s set up with adjustable bands, manifolds, and isolation valves. All tank valves accept yoke or 2 bar DIN Regulators. Nitrox and helium are available now. Training in the use of nitrox and "tri mix" mixed gasses, as well as deep dive training are strongly suggested prior to your visit. Because of the nature of the environment at Bikini, the diving is considered advanced. It is recommended that only divers with proper training, experience and skill levels consider going to Bikini. Depending on the particular goals of each week's group, the normal plan is 2 deep dives per day. There probably will not be ANY night diving because the habits of the sharks are not known yet. Reef diving may provide shallower dives for afternoons or a change of pace depending on the group. There are very flat reefs, as well as gentle sloping, sharp drop-offs and walls. This area has been untouched for 40 years and has very prolific sea life including sharks, tunas, marlin, rays, turtles and much more. The US Dept. of Energy (DOE) and Lawrence Livermore Laboratories have done extensive research and monitoring of Bikini. Their reports state in general that the environment poses no radiological danger. However, there are some very low amounts of residual cesium deep in the soil that may be absorbed into plants with deep root structures such as coconut trees. If these plants are consumed in large quantities over a long periods of time, an unacceptable level of cesium may be absorbed by humans. All guests at Bikini will be made aware of the unique environment and the dangers not only of deep diving but of the radiological concerns. Before airline tickets are issued the guest(s) must assume all responsibility of their visiting Bikini. They will be required to hold harmless any service provider involved with their trip. If the prospective guest(s) have any reservations or concerns about potential problems, they should consider an alternate destination. A steel-hulled vessel with a waterline length of 830 feet and a flight deck of 888 feet officially weighing 33,000 standard tons. At the time the Saratoga was subjected to the Baker blast her armament consisted of four aircraft; three "Helldiver" navy single-engine dive bombers and an Avenger single-engine torpedo bomber that can be found in the hanger. Eight paired 38 caliber guns in four houses -- two forward and two aft, 12 single 38 caliber guns and 24 Bofors antiaircraft guns of which six have been located and 52 Oerlikon antiaircraft 20 mm guns of which five have been located. Twelve Mk 51 gun fire-control directors can be found next to the antiaircraft guns. Presumably "live" ammunition can be found on and around the vessel. The Saratoga lies upright in 180 feet of water. The superstructure is at 70 feet, deck at 100 feet and the airplane hangers at 130 feet. The Saratoga is the only "divable" aircraft carrier in the world. The USS Saratoga sank on July 25, 1946. This steel-hulled vessel was considered the flagship of the Imperial Japanese Navy. Also the sight of the surrender of the Japanese in 1945. 708 feet in overall length, the Nagato weighed 38,500 standard tons. Nagato's armament consisted of eight 45 caliber guns, twenty 50 caliber guns, 4 antiaircraft guns, three machine guns and eight torpedo tubes, 4 above the water and 4 below. The gun turrets have not separated from the barbette. The Nagato sank on July 29, 1946 a few days after the Baker test bomb detonated near her. The ship is inverted, lying in 160-170 feet of water. A riveted steel vessel, the Arkansas is 562 feet long with a maximum beam of 106 feet and a draft of 29 feet and weighing 23,066 standard tons. Fitted to be a flagship, the Arkansas contained more elaborate quarters than standard. Prior to the Able blast, the Arkansas was fitted with blast gauge towers, test equipment and test ordinance. A 90mm howiszter was also secured to the deck. Armaments that can be found are three 51 caliber Mk13 guns on single mounts, damaged shutters and splinter shields from 40mm antiaircraft guns. Inside the casemate, two 5-inch rounds can be found in the ready rack. There were no recorded alterations made to the Arkansas prior to the Baker blast. The seriously damaged Arkansas lies inverted on the bottom of Bikini Lagoon in 180 feet of water. The keel is at 100 feet and the weather deck is at 160 feet while the aircastle can be found at 170 feet. There are many passageways that run through the ship. The port aircastle leads to the entrance of the Admirals cabin. It is believed that the Arkansas was literally "smashed" down to the sea floor after the Baker blast in 1946. Photo courtesy U.S. Park Service A welded and riveted, high-tensile-steel submersible that was 311.8 feet long and weighed 2,424 standard tons submerged. Known alterations to the Pilotfish prior to the Able blast included weights, wire rope moorings as well as salvage fitting connections. The two periscopes were removed and the shears scope tubes were blacked out. Submerged for the Baker blast, the Pilotfish was moored at a depth of 168 feet at a range a 363 yards from the point of the blast. The armaments onboard include a single 40mm rapid-fire recoil-type gun. Aft, on the after cigarette deck of the sail is a mounted twin 20mm Orelikon gun. The Pilotfish is almost completely intact with exception of a small portion of the conning tower which was blown away. The Pilotfish lies upright at 175 feet. The conning tower can be reached at 130 while the deck is at 150 feet. The only open hatch is the after escape trunk. The submarine is believed to be flooded. A welded, riveted and high-tensile Balao-class steel submarine, the Apogon, 311.8 ft. long overall and 47.2 ft. high, could dive to depths of 400 ft. The Apogon played an important role in coordinating attack information with other boats and was part of a succesful raiding party known as the "Mickey Finns," which sank 41,000 tons of Japanese shipping. The boat's primary armaments consisted of ten 21-inch torpedo tubes--six forward and four aft--and 24 Mark torpedoes. The boat also mounted a single 5-inch/.25-caliber gun onto the deck. On September 11, 1945, the Apogon was selected to take part in Operation Crossroads, a Navy test. The vessel was modified to submerge and surface without a crew during the exercise. Lightly damaged during the Able Blast, the Apogon sank during the Baker Blast into 180 feet of water. Salvage attempts were made and then shortly abandoned. A welded steel destroyer, the Lamson was 341.3 feet long overall, with a waterline length of 334 feet. Armament consisted of a main battery of five 5-inch/.38-caliber guns and three 21-inch torpedo tubes mounted on deck. The Lamson additionally carried four .50-caliber machine guns, two depth charge tracks, and "K"-type depth charge projectors. 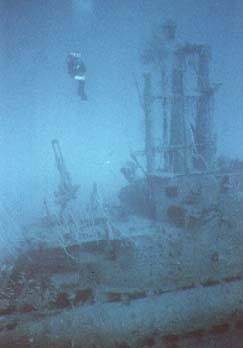 The Lamson was heavily damaged and sunk during the Able Blast on July 1, 1946. The test burst tore off the light topside superstructure, stacks and mainmast and smashed the bridge. The Lamson is lying upright with her stern near a hole indicating she sank stern first. The guns remained in the mounts and the torpedo tubes are intact. The depth charge tracks are twisted and torn nearly beyond recognition. Another notable fact about the Lamson is that in July, 1937, nearly one year after her commission, the vessel searched the Gilbert and Marshall island groups for the missing aviator Amelia Earhart.